I think I heard this was terrible. But then I might have conflated it too much with Pauly Shore. I had in mind that the bird was voiced by Pauly Shore in the “falling out of favor” part of his career. So I have no idea what to expect besides “talking animal road movie”. It has Tony Shaloub, so it can’t be too bad. Misha Vilyenkov emmigrated from Russia to become an American “big shoot”, leaving a life as a literature teacher and becoming a janitor at an animal research institute. Out of all the animals, only one is stuck down in the basement, a parrot of “the biting kind”. Misha catches the bird talking (not just mimicking) and eventually gets “Paulie” to tell him his story. Paulie was given to a little girl named Marie as someone to practice talking to in order to correct a stutter, but when she would tell her parents about conversing with him, they thought she was having trouble separating fantasy and reality and separated them. Determined to one day reunite with Marie, Paulie learned life lessons travelling cross-country with a widow, a restaurateur, and a con artist before Misha found him. Am I getting this confused with another movie, or was the publicity for this really that bad? For a film I remember so vaguely, the former is quite possible, though it’s always a good bet a movie was misleadingly sold. What I remember is talking animal hijinks and a lot of cars. There are really only two major vehicles in this story, and a lot of drama. 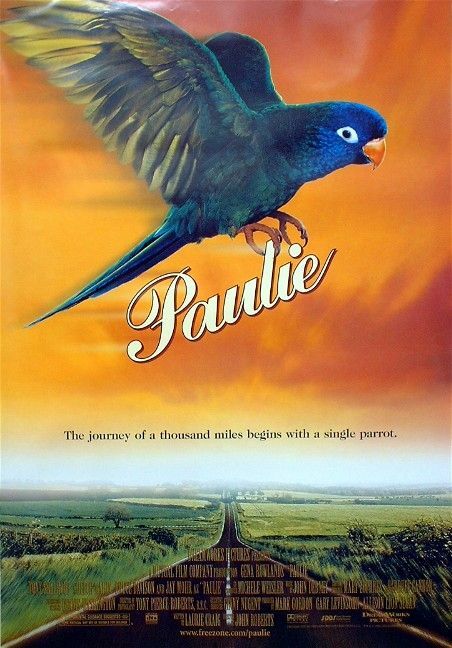 I was reluctant to use the poster I used because it’s not the one I saw the most (also the bird looks blue and Paulie is green), but it probably captures the tone of the movie better. The dissonance between the ads I remember and this movie makes me think Beverly Hills Chihuahua might actually be okay, and that is a dangerous thought to be having. Tony Shalhoub has the most chance to show off his skills in this movie, and he delivers because it might not be possible for him not to. Jay Mohr’s vocal performance as Paulie amuses and pulls heartstrings, but it seems kind of low to audition Buddy Hackett for the part and then give it to a lesser name doing a Hackett impression. Though on the other hand Mohr does manage to sound like a parrot doing a Buddy Hackett impression pretty consistently, and I’m not sure I’ve seen evidence Hackett himself could do that. The movie makes up some points by giving Hackett a cameo, but it’s only a cameo. Gena Rowlands seems like someone I should have heard a lot about, but I wasn’t able to find anything familiar in her filmography. I’m not very fond of the “how I got this low” storytelling form. It drastically limits the places the story could go, and dampens any positive swings along the way because we know how badly it’s going to crash down later. However, telling the story in order would not only give Shalhoub much less to do, but also likely completely restructure the end, since putting an ellipsis where he learns the story would deaden its impact on Misha. Because of the structure of this story, it becomes Misha’s story, or the story of how Paulie’s story changes lives. And although it manages to both wrap things up a little too neatly and leave a big mess to clean up, it really seems to flow well as the story of Misha’s moment of growth. I expected a movie about a wisecracking bird on the road, but I got a film about a wisecracking bird in a dungeon, and all the better. It didn’t turn out to be something I wouldn’t have chosen, but it wasn’t hardly the plastic farce I was resigned to, and I’m glad of that.